I love making breakfast from scratch. There is something so great about making up a big batch of pancakes or waffles and then enjoying them with butter and maple syrup. My love of breakfast foods comes from my father. Growing-up my father could only make one dish, fried potatoes. So every Sunday he would wake up early and make a huge breakfast. My mom would help with making the pancakes and I would make the scrambled eggs. It was one of my favorite things about my family growing up. I have never lost this love of breakfast and my two boys have followed on the tradition. My youngest son especially loves pancakes. He somehow managed to eat an entire batch of pancakes all by himself this morning. I don't know how he can eat so much, but never gain an ounce. Since everyone in my house loves breakfast I try new breakfast recipes frequently. Today I tried a new recipe for Basic Buttermilk Pancakes from Redbook Magazine. This recipe has 7 ingredients. It takes 15 minutes of total time, all of which is active and makes 16 4-inch pancakes. Since I eat gluten-free I used brown rice flour instead of all-purpose flour. Additionally I substituted canola oil for the unsalted butter and decreased the amount to two tablespoons. Since my youngest loves blueberries I added 1 1/2 cups of frozen blueberries to the batter. The best way that I have found to make great pancakes is to use a griddle. They always turn out nicely browned and never under or over done. After the pancakes were done I topped them with maple syrup. I followed the remainder of the recipe as written. These pancakes turned out perfect. They weren't too sweet and the blueberries blended perfect with the maple syrup topping. I had to make an additional batch since my youngest ate the entire first batch. He really loved them, especially the blueberries. These pancakes are also a great base for making a number of changes such as adding chocolate chips, bananas etc. 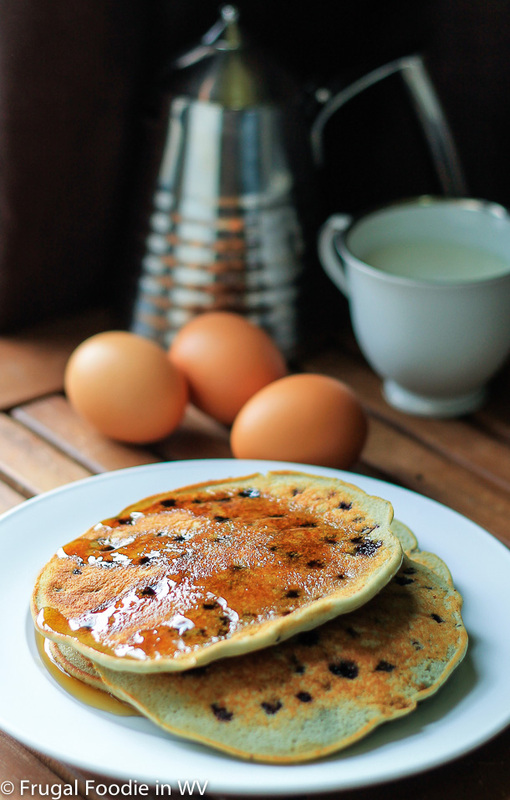 For the recipe go to Easy Buttermilk Pancakes with Blueberries. That is my favorite - blueberry pancakes! Gonna make them this weekend. They are my favorite also! We love breakfast, too! it's a big deal in our house! And sometimes we even have it for dinner. Btw, fried potatoes are one of my favorites! Blueberry pancakes are my all time favorite breakfast food!!! Delicious! Your photo makes them look utterly mouth-watering. So yummy! Thanks :) They really did turn out great! Oh girl I am in heaven just looking at those tasty pancakes. I have to admit that I have never made any from scratch. I am trying to go healthier so I do believe this is a good way to start. Especially since berries have been so inexpensive here lately. Have a wonderful weekend! They really are easy to make from scratch and worth the effort I promise :) Have a great weekend also! Whooo whoooo.....# 1900. Your newest follower from the blog hop! http://www.feralturtle.com Looking forward to getting to know you. Cheers. Followed you back :) Come back again soon and try some recipes! These totally look worth every single second of time spent making them, yum! Gorgeous pancakes! thanks for sharing on Foodie Friends Friday Linky Party! I LOVE pancakes - THANK YOU!